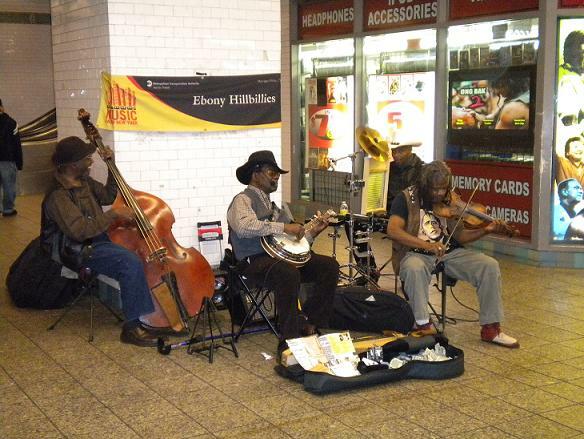 Above are the Ebony Hillbillies in (I think) the 42nd Street subway station, doing old-timey songs such as “Hard Times.” There was a decent-sized audience, as seen below. Speaking of old-time sounds, how about this fellow on musical saw? I think he was in the Rockefeller Center station. He was performing some recognizable pop chestnut that had me humming, although the title has since slipped my mind. 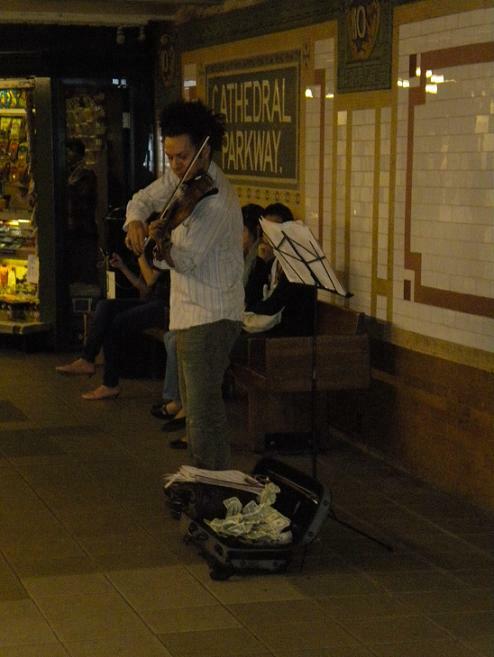 And at the Cathedral Parkway platform, this man was regaling us with Vivaldi’s “Four Seasons,” and quite well. That’s one thing we don’t encounter much in suburban L.A.: random music. Our loss. Gee, and you didn’t see any in your rides around LA’s subway system? Next time you’re on the Red Line, there’s a guy with a portable keyboard who hangs out just at the bottom of the first set of stairs leading down from 7th and Hope into the Metro/7th Station where the Red/Purple and Green lines converge. 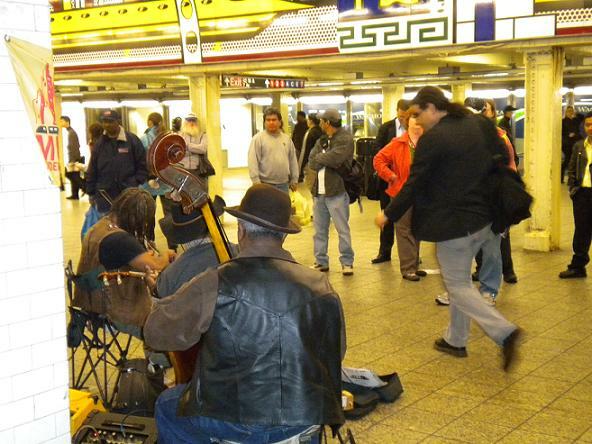 So at least Urban LA has some of NYC’s “culture.” Now if we ONLY had a saw player!!! There are urban entertainers galore most days at Venice Beach. A different breed, perhaps, but entertaining nonetheless. It’s always a treat to come across the unexpected entrepreneur no matter what the level of proficiency with their instruments. I try to make sure I have a few small bills and coins with me when I’m lucky enough to make it to Venice. The musicians and the junk food are what make the trip worthwhile. The problem with saw players is they are hard to see. And while many are long in the tooth, their music, typically, is cutting edge. 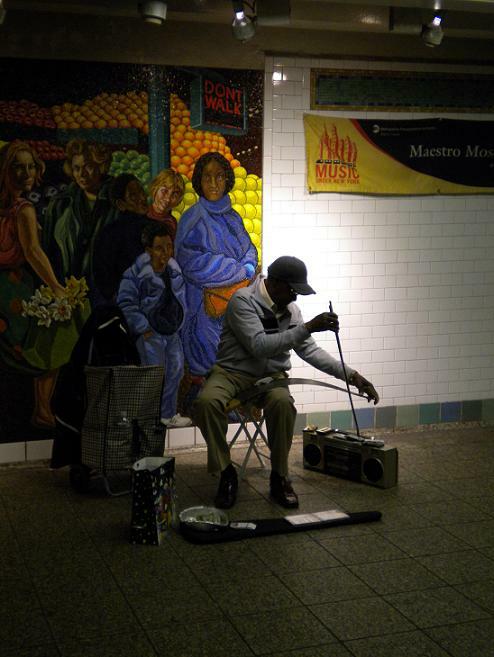 Just a tidbit — Dodger catcher Russell Martin was raised in Canada by his father, who made his living as a street musician like this. I really do love rags to riches stories.